Upgrade your Ford with a pair of N-Fab Steps + New Promo! N-Fab is back with another great offer for CARiD customers! Buy qualifying steps and get up to $60 mail in rebate. Don't hesitate any longer, the time to make your purchase is now! Offer is valid through August 20, 2018. N-Fab steps are well-known for truck enthusiasts for their sturdy, sharp look and excellent functionality. They feature long-lasting durability, fully welded brackets and easy, no-drill installation. No matter what Ford truck do you have, N-fab steps will match your truck perfectly and take its utility to the next level. Get yourself and your Ford a new pair of reliable partners – choose N-Fab Steps at CARiD! Please complete the PDF form and follow instructions to get your rebate. Separate your Raptor from the rest with Aero series Bumpers from Fab Fours! Eye-catching and practical upgrade with Podium Round Side Steps from N-Fab! Branch off c4 upgrade. Steps to upgrading? New addition to T-Rex Products - Torch-AL Series Grilles! 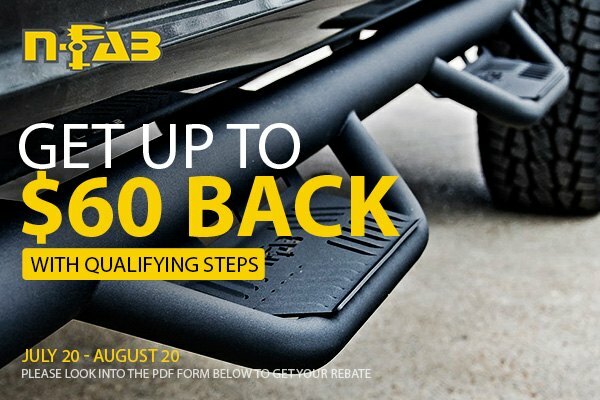 Quick Reply: Upgrade your Ford with a pair of N-Fab Steps + New Promo!